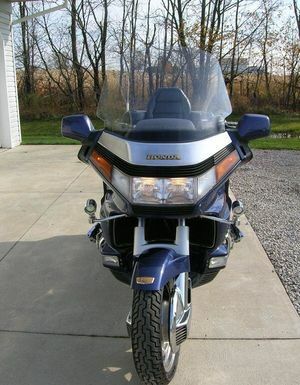 The Honda GL1500 is a motorcycle produced by Honda from 1988 to 2000. 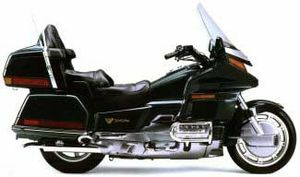 The Honda GL1500 was more commonly known as the Honda Gold Wing 1500. You may be looking for the GL1500A Aspencade, GL1500C Valkyrie, or GL1500SE Special Edition. 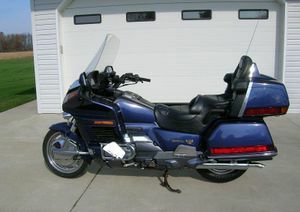 This year the base Goldwing was a fully faired Gold Wing. 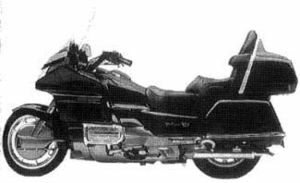 No longer did there exist a "standard" goldwing. GL1500'88 - 1988 was one of the most significant years for Honda with the introduction of a six- cylinder powerplant. 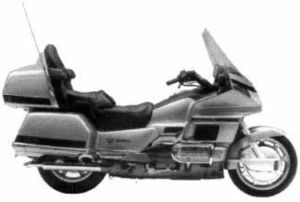 In many ways it was the natural evolution of the Gold Wing; however the progression to this model made it significantly different. While all the previous Wings had been made in the United States, some, this year, were made in Japan at the Hamamatsu factory. It was available in three two-toned colors: Dynastic Blue Metallic with Pewter Gray Metallic, Phantom Gray Metallic with Checker Black Metallic, and Martini Beige Metallic with Haze Brown Metallic. It featured front disc brake covers in gray plastic, dual headlights, computer-monitored dual downdraft carburetors, and a slow-speed reverse gear system. The engine was a 1520cc SOHC liquid-cooled opposed 6 cylinder. The transmission was a 5-speed with shaft drive. The frame serial number (i.e., VIN) for Japanese made Wings for California began: JH2SC2217JM000001 and for the rest of the U.S. began: JH2SC2208JM000001. The frame serial number (i.e., VIN) for American made Wings for California began: 1HFSC2217JA000001 and for the rest of the U.S. began: 1HFSC2208JA000001. The engine numbers whether made for California or the rest of the U.S. (all made in Japan) began: SC22E- 2000101. 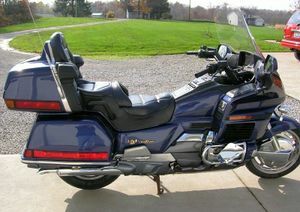 GL1500'89 - The second year for the GL1500 saw a change in that all Wings were built exclusively in the U.S. Three two-toned colors were available: Martini Beige Metallic with Haze Brown Metallic, Candy Wineberry Red with Burgundy Red Metallic, and Commodore Blue Green Metallic with Triton Blue Metallic. The bike did not significantly differ from 1988 except the front brake cover was color coordinated on the green and beige units. The red one kept the gray plastic of 1988. The rear trunk emblem which read "1500/6" was deleted. The VIN number for California began: 1HFSC220*KA100001 while the rest of the U.S. models began: 1HFSC221*KA100001. (The * is a control checksum number). The engine numbers began SC22E- 2100101. GL1500'90 - Again the 1990 model was very similar to the 1988 and 1989 models. Only two colors were available: Candy Wineberry Red with Rime Gray Metallic and Carmel Blue Metallic with Snow Shadow Gray Metallic. The front brake cover was color coordinated on both the red and blue units. The VIN number for California began: 1HFSC220*LA200001 while the rest of the U.S. models began: 1HFSC221*LA200001. (The * is a control checksum number). The engine numbers began SC22E-2200101. This page was last edited on 28 November 2010, at 21:08.